The Walkable Washington program grew out of the Feet First Cities Program. It showcases exceptional pedestrian-oriented improvements, community groups and outreach programs; maintains a statewide network for key contacts and stakeholders including an annual symposium; and provides assistance with Safe Routes to School, walking audits and other educational activities and programs. The first Walkable Washington Symposium will be held on Thursday, April 3, 9:00 am – 1:00 pm; in preparation for that event we will be highlighting projects around Washington which have enhanced walkability. 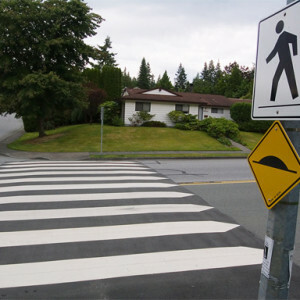 In 2012, the City of Oak Harbor improved pedestrian access at eight road crossings heavily used by school children en route to and from school. The project sought to increase pedestrian safety with curb ramp and sidewalk improvements as well as the installation of solar-powered warning lights at each of the eight intersections. A full overview of the Oak Harbor Safe Routes to School project is available here (pdf).